In Ancient Beekeeping wild swarms were hunted in spring and then put in hives made of straw, clay, or hollowed logs. At the end of summer, the beekeeper killed the bees from most of his hives, cut the honeycombs and strained its honey to separate it from wax. Some hives were kept for hibernation purposes. Other ways to kill hives were the use of burning sulphur or dipping them directly in boiling water, obtaining honey and wax. Sweet taste means that food is ripe and can be eaten. For that reason, honey and its producers, bees, have had an important role in almost all the ancient cultures. It’s not surprising, therefore, that primitive ways of animal husbandry were related with bees. Wild honey has been considered in many cultures as the food of the gods. In Mediterranean civilisations, beekeeping had its beginning in the period between 8000 and 4000 before Christ. Humans went from gathering to providing bees a place —made with different materials— to live and build honeycombs in it. The Sumerians, one of the most ancient civilisations, emerged 4000 years before Christ between the Euphrates and Tigris rivers. They already knew about bees and honey, and some pictorial writings on clay tablets which contain some data about them have reached our days. Egyptians have left us scenes of honey harvesting in engravings and bas-reliefs in the tombs of the pyramids of 3500 before Christ. 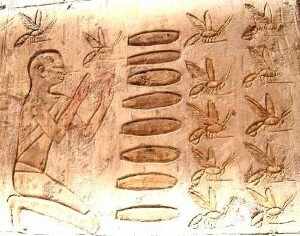 In ancient Egypt it was believed that when the Sun God wept, his tears turned into bees by the moment they touched the ground. For this civilisation, bees were something special, since its products were used in medicine, funerary rites and as offerings to the Gods. Phoenicians, Greeks, Romans and Arabs also noted the importance of bees to them. Nikel Jacob discovered in 1568 that bees breed queens from eggs of young larvae. Luis Méndez Torres found in 1586 that the queen is a female who lays eggs and is the mother of all bees. Charles Butler said in 1609 that the hive drones are males. Richard Remnant argued that bees were females in 1637. Hornbostel found in 1744 the true origin of beewax. Anton Janscha, Viennese beekeeper master, discovered the fecundation of the queens in 1771. François Huber, blind Swiss beekeeper, in his book “Observations”, founded the basis of bee science in 1792. Lorenzo L. Langstroth invented in the United States the movable frame with passage for bees of 9.5 mm (approx. 0.4 inches) and the hive that bears his name. Johannes Mehring invented the first wax foundation in 1857. Franz von Hruschka invented in 1865 the first honey extractor based on centrifugal force. Moses Quinby, in 1870, built the first bee smoker with bellows. Later it was T.F. Bingham who designed the current smoker. George Layens invented in 1874 the hive that bears his name.